The Arbor Day Foundation recently honored Lewis University as a 2009 Tree Campus USA University for its dedication to campus forestry management and environmental stewardship. 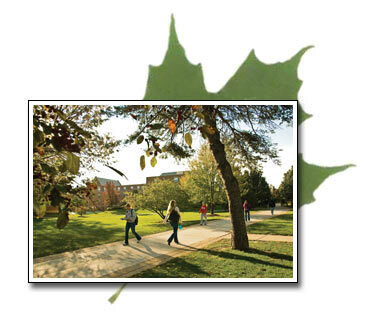 It is the fourth college or university in Illinois to be named a Tree Campus USA University. Lewis University is a veritable arboretum with over 60 varieties of deciduous trees on its main campus in Romeoville. "This designation by the Arbor Day Foundation recognizes Lewis University’s long-time commitment to the environment and our program to continually beautify our campus,” stated Brother James Gaffney, FSC, President of Lewis University. “The late Brother Ambrose Groble, FSC, started an impressive tree care initiative more than 30 years ago; Brother Augustine Kossuth, FSC, continued and enhanced this initiative; and the Lewis community builds on the program even today. “An environment that is both beautiful and sustainable creates a wonderful atmosphere for our students, faculty, staff and many campus visitors,” Brother Gaffney continued. Tree Campus USA, a national program launched in 2008 by the Arbor Day Foundation, honors college and universities and the leaders of the campus and surrounding communities for promoting healthy urban forest management and engaging the campus community in environmental stewardship. Tree Campus USA is supported by a grant from Toyota. Lewis University met the required five core standards of tree care and community engagement in order to receive Tree Campus USA status. Those standards are establishing a Campus Tree Advisory Committee; evidence of a campus tree-care plan; verification of dedicated annual expenditures on the campus tree-care plan; involvement in an Arbor Day observance; and the institution of a service-learning project aimed at engaging the student body. Colleges and universities in Illinois that have earned the Tree Campus USA University designation include Lewis University, Illinois State University, Illinois College and Moraine Valley Community College. The Arbor Day Foundation launched Tree Campus USA in the fall of 2008 by planting trees at nine college campuses throughout the United States. More information about the Tree Campus USA program is available at www.arborday.org/TreeCampusUSA. The Arbor Day Foundation is a nonprofit conservation organization of nearly one million members, with a mission to inspire people to plant, nurture, and celebrate trees. A Catholic university sponsored by the De La Salle Christian Brothers, Lewis offers nearly 80 undergraduate majors and programs of study, accelerated degree completion options for working adults, various aviation programs and 22 graduate programs in nine fields. The ninth largest private, not-for-profit university in Illinois is being honored for the sixth consecutive year by The Princeton Review and U.S. News & World Report.